It’s been raining. For days. And I don’t mind, honest. It’s a lot better than snow. It rained again last night. One of the sump pumps died (yes we have TWO) so the plumber is coming to install a new “spare” sometime this morning. But isn’t the front walk beautiful? A little moist perhaps. I love the reflection. I was concerned because the surviving sump pump was spewing all the water out into the front yard. The pipe ends about a foot above the edge of what could be a flower bed, if I ever cared to make it one. 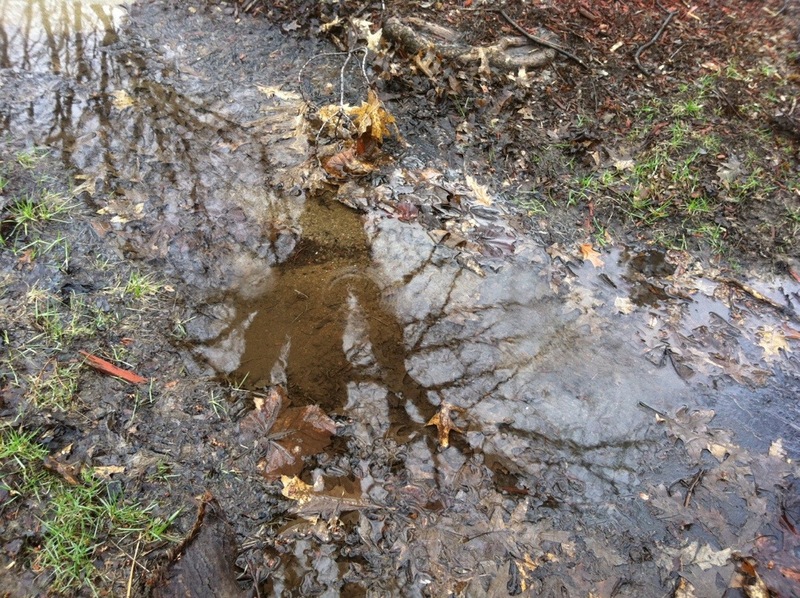 The incessant torrent of water created a small pool in the dirt about a foot deep. Then it overflowed across the front walk making the front door distinctly out of bounds. I found a chunk of PVC pipe in the garage and stuck it over the end of the pipe, balancing it on a tree trunk that floated by. That got me about four feet. Not long enough. The pumped water was still feeding the walkway pond. Then I got a brilliant idea while making room for the plumber downstairs. (I only pick up when company comes. ) I found a huge bundle of bubble wrap! 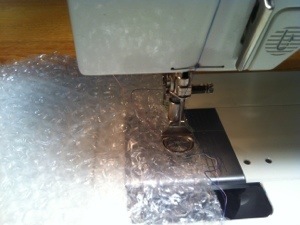 I tried sewing the bubble wrap together, but the feed dogs on my Bernina aren’t used to the bubbles. I tried popping them and then sewing. No go. I dropped my feed dogs and attempted to free-motion quilt the sections of bubble wrap together and broke my needle. So, I resorted to using clear packing tape on the short seams and duct tape on the long seam. I slid my bubble wrap tube onto the free end of the second pipe and secured it with zip ties. As long as the duct tape was on the top there was very little leakage and I was able to divert the water about 12 feet down the driveway. Success! I am so proud! Here’s a mercifully short video of the water flow. I was entertained by my little “diversion.” Warm and DRY thoughts to all who are dealing with serious flooding. Stay dry. Happy Valentine’s Day	All Thread! Scarey! That looks almost like a sinkhole opening up in your back yard! I know. Flipped me right out when I saw it. isn’t it funny how we quilters and sewists approach every problem with a sewing needle? My husband? With a hammer and pair of pliers. Hey, we each have our own skill set. Lemme thread that needle; it’s got to be good for something! Thank you! And it seems to be working! Brilliant woman Ami! And stubborn enough to make it work! When I fried the shredder last week by feeding it too many pages of old IRS paperwork, I burned six grocery bags full by standing a roll of fence wire on end in the middle of the back yard, and feeding the stuff down the “chimney”. Covered the yard with ash, but no papers escaped. We won’t discuss how the faucet fell off the water pipe into the house when I decided a fire should have a hose nearby, but my very handy neighbor had all the parts we needed, and by the next day I could turn the well back on. Yikes! I had no idea you liked to play with fire! Hurray for good neighbors. As my techie husband would say, “It’s not a bug; it’s a feature!” Yeah, a water feature . . . .
Ami, You are my hero! What cleverness!! Love the printed duct tape! I have a nice assortment. Thought the job required something festive. Quilters can solve most any problem and we often get our inspiration from you! I see you didn’t use just any duct tape… You made a pretty ‘pipe’ while you were at it!! I do get a kick out of problems I can solve creatively. Plus it encourages me to save more garbage like used bubble packing….Steve is thrilled! Good thinking, Ami! Necessity really is the mother of invention. Thank you. Even the plumber was impressed. 80 degrees and lots of rain Thursday, water standing everywhere yesterday, snow today! How rude Michigan weather is. Yeah , the snow was particularly welcome. Not. How about that…. 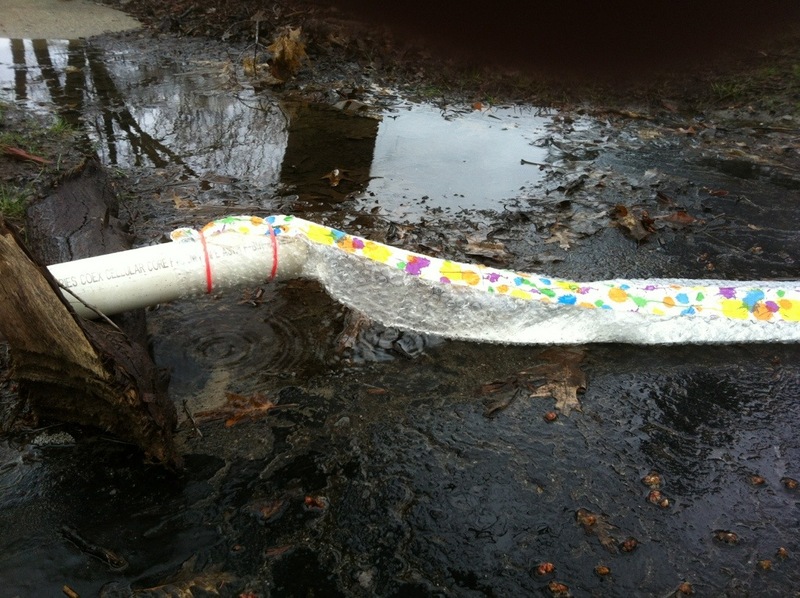 Sewer diverts water to sewer!! You are sew clever! I snorted out loud when I read your comment! At our house, we call things like that “The Charbonneau Way.” Don’t ask why we needed to replace the (detached) garage window because my husband was working on a repair project in the basement! I do love your very festive duct tape!! I love that bubblewrap is colorful! Helps brighten up a dreary week! Me too. I need to go out and buy more. I used up all the pretty stuff. Now, that is serious creativity! I am impressed! Deep bow with a smile. Now I feel bad that I complained about the SNOW we got last night! So sorry for your mess. We are never without duct tape or clear packing tape….amazing what they can do! Ami, McGyver has nothing on you! Don’t you just love zip ties? Velcro & PVC pipe are some of my favorites, too. I love seeing the world through your eyes. You are an inspiration to all of us. Thank you! You are very kind. Sadly, you will just encourage me. I live next to the Flint river, north of Lapeer and am beginning to wonder if I’ll be living extremely “next” to the river soon. I’m almost glad we’re having snow showers (and I really really hate snow) instead of rain showers. I hear you. Roll up your pant legs just in case! Not at all surprised at your cleverness. We quilters always turn to our machines to fix just about anything. Mine doesn’t care much for fixing leather halters…..breaking needles like crazy. Have learned to wear safety glasses. Good job Ami. You’re such an inspiration. Nancy, are you using leather needles? I ask because I just found out there is such a thing! Well, that was a great solution. My husband used to say he could fix anything with duck tape and a hammer. And often did. I only have one sump pump. Am I deficient? Cindy in Virginia, where the pollen is overtaking everything. I am so not a gardner. Everything I touch dies a horrible death. But I do enjoy looking at all the work other people do. You are one resourceful woman, Ami!!! Certainly hope that things dry out quickly. 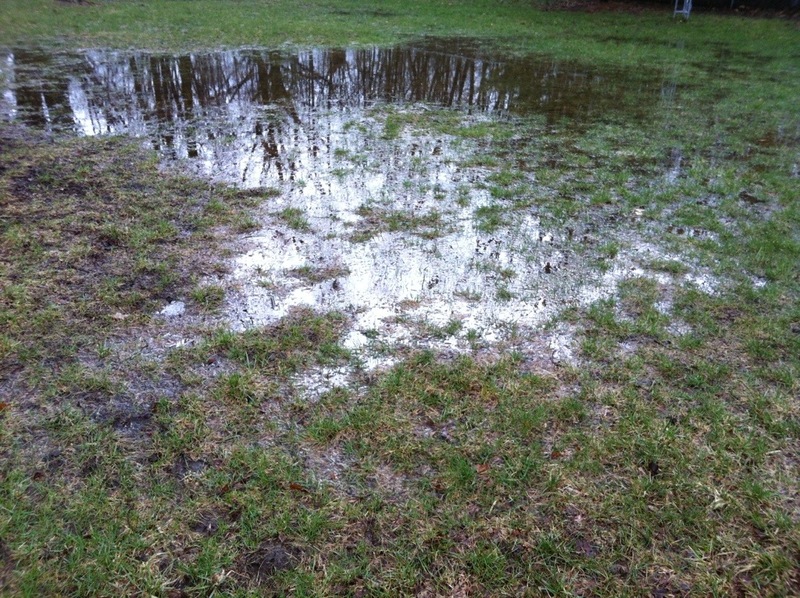 I know our sump pump has saved us from many disasters….probably the most important thing we have in the house!! Good Luck!! I’ll try to send some sunshine your way (altho it has been rather scarce here also). By the end of the day, I could see the lake was already smaller. Don’ forget the beauty of bubble gum. Overflowing gutter, draining into the basement. Solution you ask? Well, old broken wheelbarrow with no wheels to catch the water then a piece of gutter to direct away from basement. Oops holes in the wheelbarrow, hmmm what to do… Bubblegum, that’s right, chew it up, at least get the flavor out, and plug the holes. No more water going into the basement. Hubby thought I was nuts but it worked so I gothugs & kisses!! Oh my gosh! What a great story. I see a future quilt in that picture of the tree reflected in the water! Really expressive. Love all you clever women. Here in northern CA. we have weather in the high 80’s and NO rain. What happened to April showers? Everything is blooming early and I have to water nearly every day…wish you could send some ‘liquid sunshine’ my way. You can have all the water you want. Tilt your computer monitor toward Michigan and I’ll pour some in.